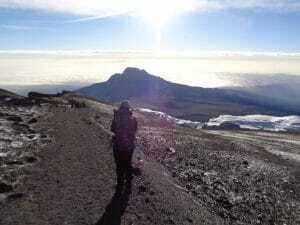 How Climbing Kilimanjaro can help you live a better life. So you got this idea into your head that climbing Kilimanjaro was a good idea. I was reading an article on supporting a non-profit in Uganda which lead me to Ian Taylor Trekking. I ended up on this page about Ian’s support for Fields of Life and how he and friend raised money to build the Mt. Everest primary school in Kitandwe Uganda. That lead me to Kilimanjaro. I watched Ian’s video’s on climbing Kilimanjaro and in that moment I decided to climb for a cause. I had no idea where to start my understanding of what was involved in the climb. 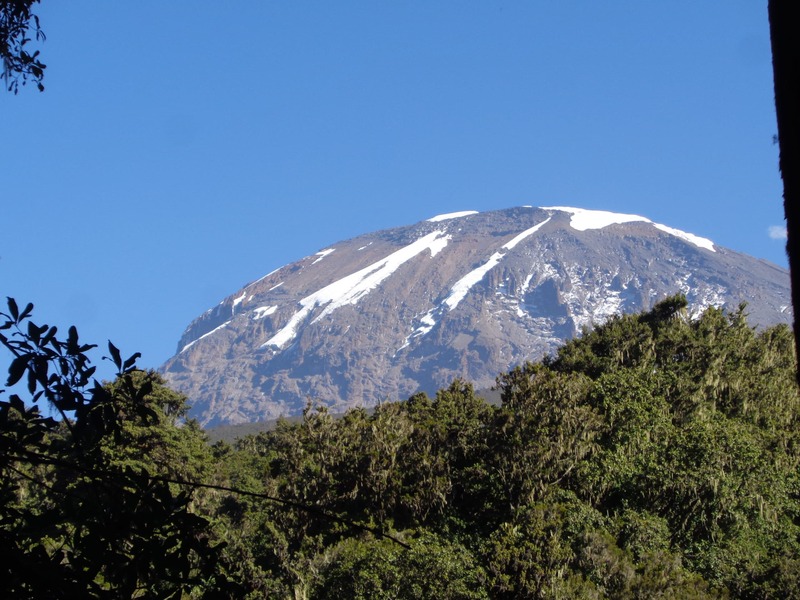 I started reading through all of Ian’s Blog posts on climbing Kilimanjaro and started to understand all the different aspects of preparation, the climb and how I could make it to the top. Here is a really helpful starting point. I knew Kilimanjaro was the highest mountain in Africa. I learned Kilimanjaro is in Tanzania, and one of the famous seven summits. The highest mountain on each continent. Mount Kilimanjaro is completely in Tanzania although Kenya some times claim the mountain. Mount Kilimanjaro is the tallest freestanding mountain in the world, standing 19,341 feet above sea level. It is made up of three extinct volcanoes, Mawenzi, Kibo and Shira. My goal was to reach the true summit on Kibo, the highest point. 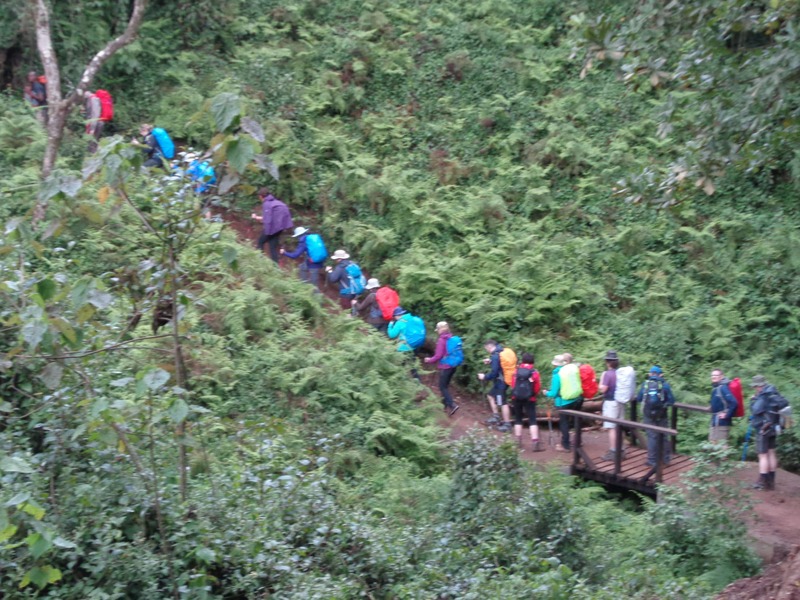 I also learned that Kilimanjaro supports five major Eco-zones: Rain Forest, Heath, Moorland, Alpine Desert and Glaciers. The most important thing for me, was to formulate a good training program and Ian really helped me put this together. I learned that you have to understand altitude, the elevation gains and acclimatization process to really have the right training plan. Once I understood the challenge and how to train. I needed 6 months to get mountain fit. I exercise regularly but needed to adapt my training for endurance and strength. I trusted Ian’s plan as he had climbed Kilimanjaro 30+ times. I trained slowly at first and build the hours and weight over a period of months. I can now say Ian’s way of training worked. I enjoyed every minute of the summit night and I enjoyed the experience so much more because I came prepared. I saw lots of people on the trail struggling and not really enjoying the experience because they just didn’t train right. 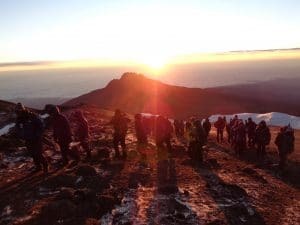 From my experience preparing to climb Kilimanjaro and while I was on the mountain I came up with these five most important things you should know before climbing Kilimanjaro. If you are considering climbing, this how you should approach your climb. The feeling you get standing on the summit of a mountain, is a feeling like no other. When you reach out and challenge yourself, that is when you are learning, feeling experiencing and truly growing. Standing on the roof of Africa and highest free standing mountain in the world is a feeling like no other. I believe an experience is 50% the place and 50% the people. The feeling of real raw emotion with as all of our team stepped walked together toward our goal was truly amazing. Each person with their own story to tell and each one achieving their on summit. Collectively we were achieving something together and that was a great feeling. The challenge was great, the lack of oxygen testing, but I left more alive in those moments than I have ever felt. This whole journey to climb Kilimanjaro thought me a lot. It also gave me a lot. It gave me the chance to become fitter and stronger. I now have more energy for other challenges that life presents. I learned about nutrition, heart rate training zone, the skills to lead a healthier lifestyle. I Learned that you need ups and downs to show you, your true self so that you can take pride in your training, summit, success and belief that you can take on bigger and harder challenges in all areas of your life. I came away with an amazing personal experience. The journey was a great one. While I stand on the summit of a mountain. Others in Africa are struggling to get clean water. I wanted to raise money to build some wells. Ian is an ambassador for the charity Fields of Life. I was able to raise enough funds to build two wells. 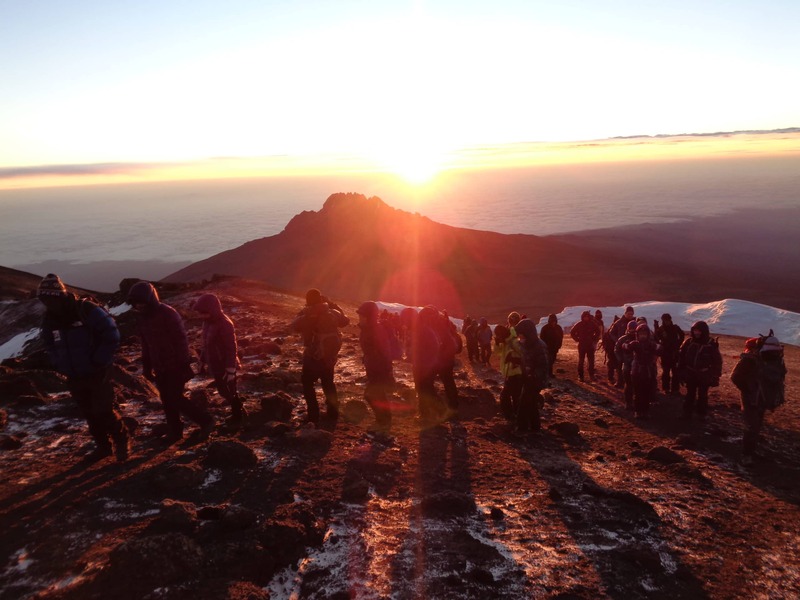 Climbing Kilimanjaro for a charity makes a difference in other people’s lives. I had the opportunity to use my climb to raise funds in support of others you don’t have the opportunity I had. Others in Africa are climbing their own mountains just in a different way. 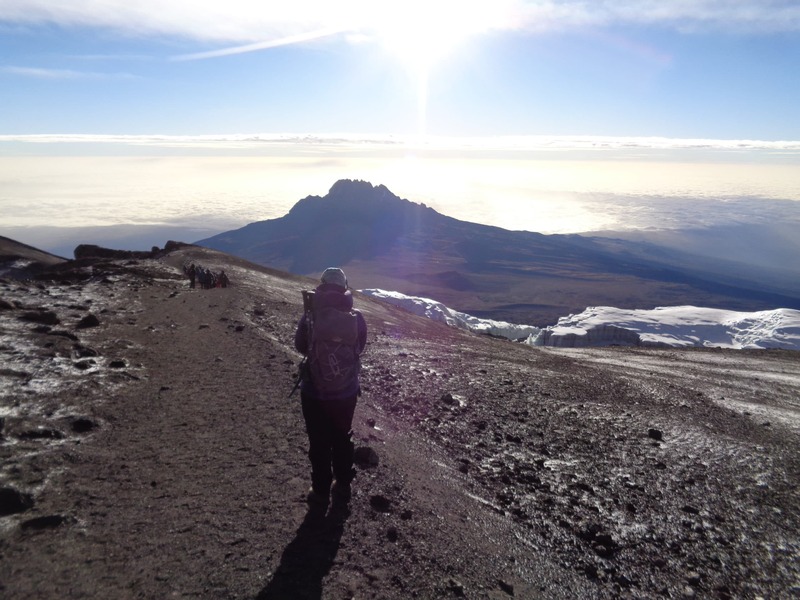 Completing the Kilimanjaro climb is something to be proud of. Something that is a massive achievement in anyone’s life. That is why you do not want to underestimate the climb. On an annual basis less than 50% of people make it to the summit. This is because they do not have enough acclimatization built into their trip or they failed to train or come with the right physical conditioning. E-mail Ian, Call Ian. He help me and over 2,000 people reach the summit. He has climbed Kilimanjaro over 30 times so he knows what he is talking about. Don’t be fooled by anyone telling you it is easy. Unless you have been to high and extreme altitude before you need to be prepared, you need more time on the mountain and you need to work with people who have been their many times. The experience of Ian’s guides was top notch. Some have trained in Europe, been to the Himalaya’s and his team love him and his set up. The team I spoke to, spoke very highly of him. The food, tents, toilets, equipment, oxygen and set up was first class. 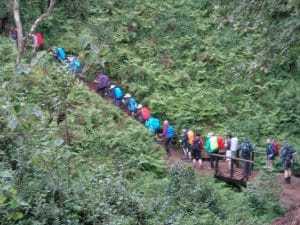 The support I got from Ian and team prior to the climb was also first class, always available, super knowledgeable. They were the main reason I made it to the top, the gear advice and along with training advice was like nothing I had ever received in the past. If you are climbing or trekking anywhere you need to consider Ian Taylor Trekking!! If you are Interested in climbing Kilimanjaro give Ian a call!! I want to thank all the team at Ian Taylor Trekking, the full time staff on the ground where world class, from Chef Ede to Athumani the team really looked after us at all time. We had 1 to 1 on the summit night. Amazing support, guidance, patience, assistance. I can not say enough about Ian and his team. A life changing experience.